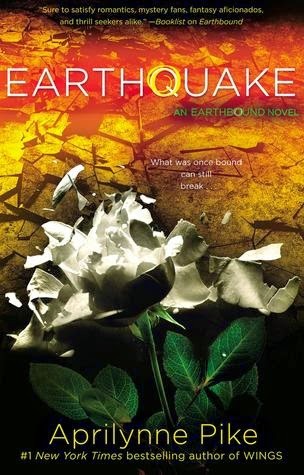 Earthquake is actually book #2 in the Earthbound Trilogy. Although I never write spoilers, if you haven't already read book #1 this review may spoil the first book. You can CLICK HERE to read my Earthbound review. I have been enjoying the Earthbound series, so I was excited when Earthquake was released. Earthquake takes off right where we left off last. Tavia has remembered partially who she is, and that she is an Earthbound. She is seeking out her eternal partner Logan, to warn him and help him discover who he is. It takes Logan a little time, but eventually he remembers. Immediately, he falls right back in love with Tavia, after all he's been her life partner 1000's of lifetimes since the beginning of the earth. The only problem is Tavia is not so sure. This lifetime for her is different than all others. Because of the plane accident and her brain injures she cannot recall all of the memories of past lives like Logan and the other Earthbound can. When they are rescued they are brought to an underground compound owned by the Curatoria. Tavia doesn't trust them, but finds she has no choice for the time being. She enlists to help save earth from the deadly virus that is spreading and killing humans at an incredible rate. Additionally, they find the virus has spread to Earthbound, and when the Earthbound start to die the world is thrown into turmoil. It becomes a race against time. As Tavia slowly begins to remember things that no one else knows, or can know about her. Then it becomes a race against her own safety. As if the fate of the world isn't enough, her old love interest shows up in the Curatoria prison. It's then she can't decide if she has feelings for Logan or Benson. At the same time she is trying to decide if she can even trust Benson after all the past betrayal. At a time when Tavia must trust someone, but very few around her are trustworthy, and trying to figure out who is, is a battle in itself. The world is crumbling and people are dying, the choices she makes may effect not only herself, but the entire fate of the world. I enjoyed Earthquake as much as I did Earthbound. Aprilynne Pike did a great job of keeping the second book in this trilogy interesting, fast paced and full of action and intrigue. If you are an Aprilynne Pike fan, you will want to read this fun fantasy series!